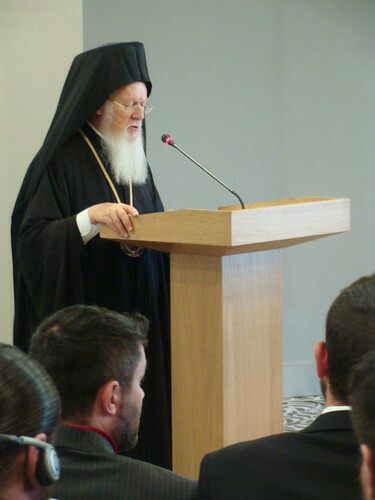 From May 1-4, 2014 over 50 Youth Workers from around the world gathered together in Istanbul, Turkey at the invitation of His All Holiness, Ecumenical Patriarch Bartholomew for the 3rd International Orthodox Youth Workers Forum. His All-Holiness invited Youth Workers from the Churches under His Omophorion to gather together for 3 days of learning with the specific tasks of discussing and learning about the issues facing our Youth Workers in their regions of the world and building an international network of Orthodox Youth Workers. Youth Workers from more than 25 countries were present to share experiences and learn from one another as representatives of their regions, metropolises, and dioceses under the Ecumenical Patriarch. His Grace Bishop Gregory appointed Very Rev. Stephen Loposky, our Diocesan Director of Youth and Camp Nazareth Administrator to represent our Diocese at this Forum. Most representatives arrived on Thursday, May 1 for the Forum which began its sessions on Friday, May 2. The Forum participants were greeted and welcomed by His All Holiness on Friday morning and then by His Eminence Metropolitan Nikitas of the Dardanelles, who sits on the Ecumenical Patriarchates Committee for Youth, is the Director of the Patriarch Athenagoras Orthodox Institute in California and who chaired this Forum. In his opening address, His All Holiness talked about the need for us to teach our youth moderation. He spoke about the world which teaches and ever entices our youth to satisfy their selfish desires and how our youth are in the Babylonian Furnace in this world . That is, they find themselves in an environment hostile to spiritual growth, one which often threatens them, and which demands they worship themselves, not God. In contrast, the Church must teach its youth how to walk by the Spirit. He referenced St. Gregory the Theologian when he said just as a rose is found in the midst of thorns, so human virtue can be found even in the midst of evil. To accomplish this, however, Youth Workers must have an intense spiritual and liturgical life. They must themselves control their passions and cultivate the Holy Spirit in their hearts if they are to minister to our children. The youth worker must not simply teach children, but must love them. That love is first cultivated in themselves and then given or transmitted to those entrusted to them. His All Holiness reminded those present that they must help children to trust God and that they must support each youth’s journey to Christ without judging them. In another reference, he instructed the participants to keep the young safe from the Evil One who seeks to trap them. We must keep our youth pure and free from the paths of the Sirens of this world, which repeatedly call to them, entice them, but seek only to trap them. He also talked about establishing basic Orthodox guidelines for Youth Ministry and support around the world. Here, His All-Holiness spoke about strategies for disseminating the spoken and written Word to our Youth and the tools we need to be using to be effective in this ministry. He spoke about the need for gathering in assemblies like this forum but also about the internet, radio and video conferencing. Nothing that seemed innovative in the world, but he also spoke about particularly Orthodox “tools” for transmitting the Word to Youth. He stressed the need to connect each youth with a spiritual father who must respect the personality of each child and support, not judge, their journey to Christ. Mentors are not a uniquely Orthodox tool, but a spiritual father is, and Youth Workers must help to connect each child with a spiritual father who can guide, counsel and support them in their journey of faith. His All Holiness also spoke of giving our youth well-translated spiritual writings and how we must cultivate in them the proper disposition in Liturgical services. He referred to the characteristics of the Church of Christ which include love, forgiveness, repentance, joy and freedom from oppression and stress. While using the tools of the modern world to effectively minister to our youth, we must not forget the “tools” that the church has used for 2 millennia to guide and guard its people; “tools” that have helped literally millions of children and youth to grow closer to Christ, long before the modern age. His All Holiness concluded his introductory remarks by reminding those present that we have a sacred duty in the work of Youth Ministry. Following the Ecumenical Patriarch’s talk, the Forum participants were addressed by Metropolitan Nikitas who explained what was expected of each of us. We were to refresh each other in our ministry, not through monologues, but through a genuine dialogue about our Youth, the challenges they face and what we can do as a Church to help them. He left a fitting image in our minds as he pointed out that most often in icons we see the saints depicted with their eyes and ears open and their mouths closed. This was a reminder that the most profitable forum would be one with plenty of dialogue, not monologue. Following the introductory remarks, the Forum participants had an opportunity to take a group photo with His All Holiness and to speak with him individually as time permitted. Lunch followed, and then it was back to work for the first Panel Discussion. The first Panel discussed issues confronting Youth Workers in different parts of the world. The moderator for the discussion was His Eminence Metropolitan Gennadios of Sassima. Among the many things discussed by this Panel at least a few things are important to note. The Very Rev. 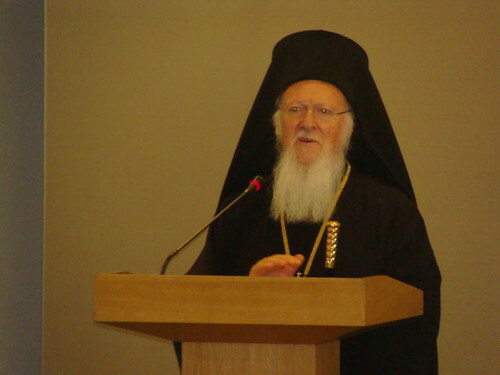 Grand Archimandrite Bessarion of the Ecumenical Patriarchate talked first about youth ministry in Constantinople where the environment is not helpful to the Youth growing in Christ. He likened the Youth Work there to painting an icon in which the background starts dark and the iconographer tries to shed light in it, and puts prayer into the icon. As Youth Workers in a world hostile to Christ, we try to shed light into the hearts and souls of our Youth to allow Christ, not the world, to shape their character. He said that the character and approach of the priest is very important; children need more than a priest. The priest must be someone who inspires them and shows them the joy of being Orthodox. The participants also heard from the Rev. Protopresbyter Amphilochios Sakalleros of Greece who reminded us that because society has problems so do our Youth. In other words, the Youth are troubled by society, they are not the trouble themselves. This discussion included how unemployment and financial problems effect our youth and how the Church engaged in Youth Ministry must help our children before they reach the point of broken homes, financial crisis and drug addiction, among other things. This first Panel Discussion also included remarks about giving our youth opportunities to serve and how best to support them in their commitment to serve Christ. Therese remarks were offered by Mr. Constantine (Dean) Triantafilou (the Director of IOCC – International Orthodox Christian Charities). In part, this led to a discussion about being genuine with our youth , that is, creating a real atmosphere, an environment in our churches which allows our children to be themselves without fear of judgment. It was stressed that we must create and sustain an environment which helps our children to know and deepen their faith. This sounds simple, perhaps even easy to some, but the reality of our children’s world is that they and their parents and families are products of their environment – the world we live in is hostile to faith and corrupting to virtue – if our churches (and families) cannot create the environment in which our children can grow and deepen their faith, then they are neglecting part of their vocation. This discussion included thoughts offered by Mr. Michael Spyrou of Cypurs who described how the Youth in Cyprus have regular “meetings” with their hierarch which allows them to express their concerns and worries to him, and allows the Church the opportunity to help them. These meetings have been very successful in creating an environment which supports and engages the Orthodox Youth in his country. This was just the first Panel Discussion if you can believe it! There were 3 others just like it. Following the first Panel Discussion, the participants broke for lunch and came back for Session 2. It was our hope to give you an indication of the level of discussion and learning which took place at this Forum. It was significant. The remainder of this article will simply highlight the rest of our schedule. Two more Panel Discussions occurred on Friday. These discussion included presenters from 10 different countries. The discussions were engaging and gave the participants of the Forum insight into the Youth Work being done around the globe. This included a discussion of the primary initiative of the Forum – to begin creating an International Network of Orthodox Youth Workers. The Forum laid the groundwork for this process to continue and, over the course of a day and night, produced a Vision Statement and recommendation which will be given to His All Holiness for consideration. The purpose of the Network is to set up communication and cooperation channels among Orthodox Youth Workers around the world within a framework which allows for an exchange of thoughts, views and experiences. More than even that, however, and this is part of the vision, this network would become a framework within which both Youth and Youth Workers could interact in seminars, retreats, and classes, not simply to learn, but to foster a clear sense of Orthodox identity and ethos. This Network would be like other networks in the sense that it helps foster communication and cooperation, but more importantly it would help guide our sense of identity and ministry by keeping us together. After the third and final session of the day, the Forum participants departed for the Church of the Archangels, a church which has its roots stretching back 1500 years, for both a visit and a dinner hosted by the parish there. The church itself was magnificent. Honestly, there were not many of us who had ever seen an iconostas that intricate and beautiful – the woodworking and craftsmanship were really incredible. The participants had the opportunity to light candles, pray and take pictures of the Church. You can find some pictures of the church on our Diocesan website. Following the visit to the church, we gathered in the reception center of the church to have dinner. A delicious meal and genuine hospitality concluded the formal part of our first day in Constantinople. 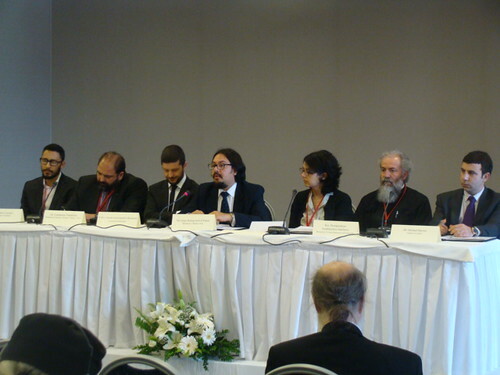 The second day included a fourth Session in addition to a reading and discussion of the official communique of the Forum. The fourth session was also devoted to the establishment of the International Network of Orthodox Youth Workers under the Ecumenical Patriarch with a discussion of the Network’s aims, vision, organizational structure and necessity. It was a profitable discussion which revealed our inherent unity as Orthodox Christians, but which also exposed the differences in the way the various regions of the Orthodox world minister to our common Youth – that is what made the discussion both profitable and very interesting, in a good way. 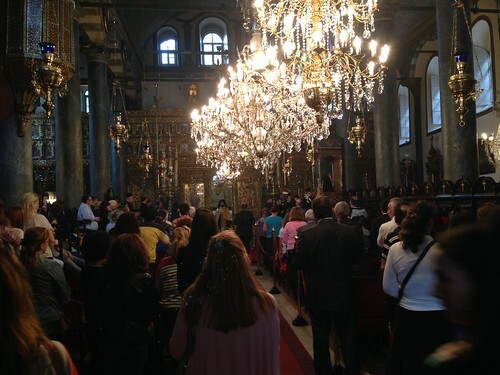 The participants ate lunch and then boarded buses for a visit to Hagia Sophia, and afterward for Great Vespers at the Patriarchal Church of St. George. 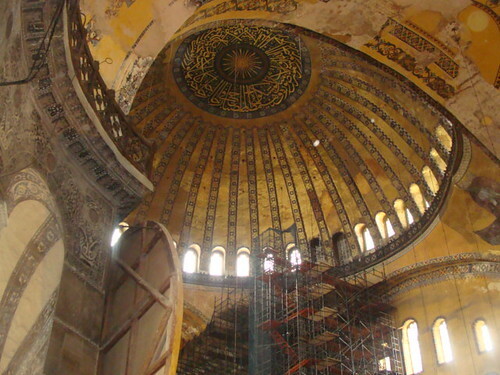 I really do not know what to say about the visit to Hagia Sophia. I have never been in a church that massive (and never will be – there is nothing like it on earth) – be aware however that at one time the attempt was made to make it look like a mosque and it is now a museum. For my part, it is still a church, and is still called The Great Church. I have never seen anything like it – remarkable in architecture, beautiful in its exposed iconography (I say exposed, because there are still mosaics that are not uncovered/restored), dedicated to the glory of God, and full of a history of prayer, liturgy, and worship. Despite what has happened in human history the remarkable nature of this Wonder of the World is apparent to the eyes and hearts of faith. I did not cry while I was there, but I cry now for a world that can produce such beauty by the hand of God and for a world that can be so destructive by its own hand. I cannot imagine the tears in its history that were shed on its floors, that were shed over its destruction, but I know in my heart that the beauty of it was inspired by God as a gift to mankind, which despite its best efforts, cannot destroy Divine inspiration and beauty. We did not want to leave, but Great Vespers at the Patriarchal Church of St. George were being celebrated and we were headed there next on our schedule. Traffic kept us from arriving on time, but we were able to be at part of Great Vespers and then to receive a blessing from His All Holiness. 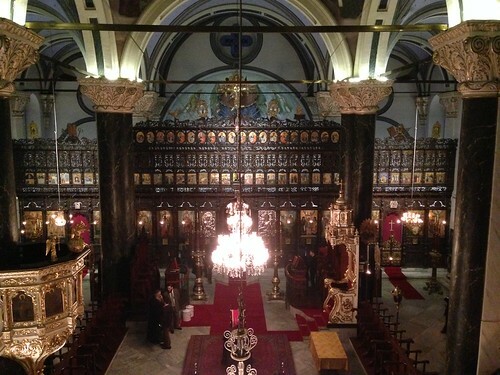 The Church itself was beautiful, and to be near the Ecumenical Patriarch for whom we pray during each Liturgy gave new meaning to those prayers. We took a group photo outside the church in the courtyard with His All Holiness and then headed back to the hotel. Out last evening in Constantinople, we headed out in groups for dinner. It had been a long day and we looked forward to relaxing with one another. It turned out to be another pleasant evening so we were able to sit outside at a roof-top restaurant and sample fine Turkish cuisine. Later we visited a café for some Turkish coffee and Turkish Delight. I’m pretty sure the Turkish Coffee has not worn off yet. The next morning, Sunday, we attended Divine Liturgy at the Monastery of the Life-Giving Spring in Baloukli. This was the way to end our time together. 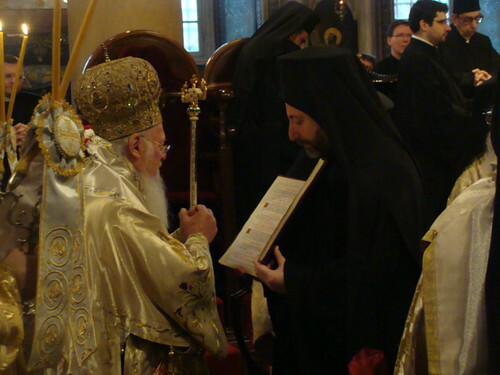 His All Holiness celebrated together with the Holy Synod of Bishops, 2 priests and 4 deacons. I loved every minute of it (all 240 minutes – together with Matins and a memorial afterwards it was 4 hours!). To have Communion together with the Patriarch, the Synod of Bishops, our brother priests and colleagues, and the faithful at this Monastery church was/is the foundation of the unity we seek through a Network of International Orthodox Youth Workers. The unity is already there in the Church and through Communion together. It is simply a matter of expressing it through a Network that enables us to be together in a different way. 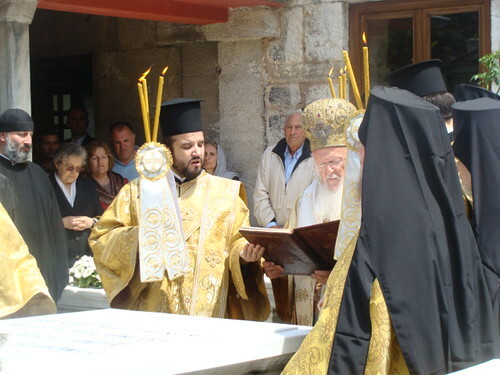 In addition to the Liturgy, the Patriarch served a memorial at the graves of the Patriarchs which are located just outside the Church. 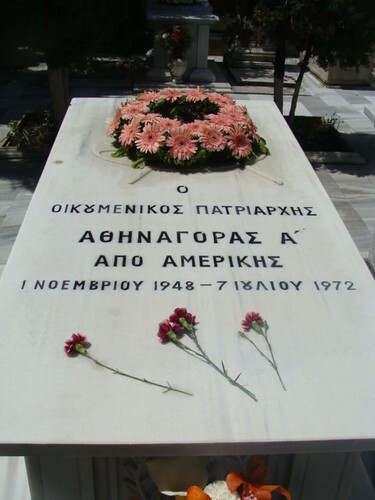 It was moving to see the grave of Patriarch Athenagoras, the one who received our Diocese back into the fold of the Orthodox Church so many years ago. We also were able to visit the Spring beneath the Monastery and receive some of its Holy Water. The church and monastery at this sight have been there in one form or another since the mid 6th century. 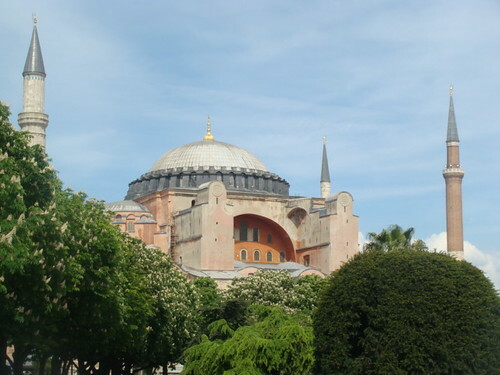 As the history of the monastery and church there are told, the Emperor Justinian had the original church built from the leftover material from the construction of Hagia Sophia. To stand and celebrate Liturgy in such an ancient and venerable place was spiritually uplifting. I wish we could have stayed there. For my part, it is not the network that will keep us together, it is our hearts. The network is the tool. My part is to keep my heart open to our fellow Youth Workers in prayer and the rest will come according to the mercy of God. This trip, for me, and I hope for others, was part of His mercy. The Very Rev. Fr. Stephen Loposky is the Diocesan Director of Youth and Administrator of Camp Nazareth.